No pine beetle outbreak and it being at low risk of a future outbreak from this native Rocky Mountain beetle. Regional land-use planning stipulating watershed protection, tourism and recreation as the highest priorities for the area; not block-cut/clear-cut logging. Since 1934, the historically most extensively logged drainages in the Castle (those of the Carbondale) being where all the major fires (> 2 sq. km) have occurred. 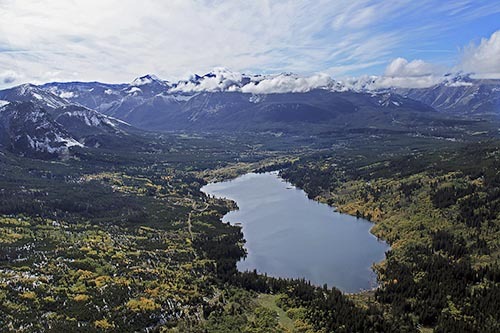 Few intact forests in Alberta’s southern headwaters and less than 9% of the Castle remaining with trees over 150 years of age, when the natural landscape there should be a third old-growth forests. The Castle providing an unsurpassed 1/3 of the annual water flow for most of southern Alberta; specifically the water stressed, Oldman River Basin and its 70 municipalities, including Lethbridge. Write a short letter to Premier Stelmach. Use the white box at http://org2.democracyinaction.org/o/5654/p/dia/action/public/?action_KEY=5663#letter Write your letter in that box, using your own words and making use of tips below (also at the above link). You can change the wording in the Subject box if you wish. Click to send when done. Copies will also automatically go to local MLA, Evan Berger and the opposition MLAs: Bridget Pastoor, Liberal; Paul Hinman, Wild Rose; Rachel Notley, NDP; and Dave Taylor, Alberta Party. After you send your letter, please take a moment and call MLA Evan Berger (403-553-2400). Berger is the local MLA. Let him know of your opposition. Print & post the poster with maps & photos. Download the poster in PDF (1.74 MB) at http://www.sierraclub.ca/sites/sierraclub.ca/files/castle-pdf.pdf or JPG (199 KB) http://www.sierraclub.ca/sites/sierraclub.ca/files/castle-pdf.jpgOpen and print with your computer’s picture printing function at letter size and post, or for more impact, save to memory stick & print at ledger size (11″ x 17″) at a local print shop & then post in public places. Ask friends & family to join the action and email them this action alert. State what the Castle Special Place / Special Management Area means to you. Ask Premier Stelmach to stop the pending logging of the Castle. Use your own reasons and/or draw from the action alert above. Ask your concerns to be represented in the Alberta Legislature. A Tourism and Outdoor Recreation Industry Advisory has been in circulation, in regards to the logging scheduled for June 2011, in the Castle Special Management Area. So far, 23 businesses have signed on to this advisory, in an effort to halt the logging. The purpose of the advisory is to inform Alberta businesses and prospective businesses to be aware that the land base in the tourism and outdoor recreation sector in Alberta is not secure, even under the pretense of presumed protective designation, such as areas zoned critical wildlife, prime protection (ie. watershed protection) and general recreation. Such lands have to be legislatively protected if businesses want to be certain that these lands won’t be sold for resource development without public notice or consultation, by the Government of Alberta. Presently facing such a threat are local businesses making use of the Castle Special Management Area. These businesses span from the Crowsnest Pass to Lethbridge and beyond. Land areas such as the castle, that are not protected by legislative designation exist all over Alberta, and could also be slated for commercial logging or other such development, thus drastically impacting the natural settings that local tourism and outdoor recreation businesses rely on for their livelihoods. Signing onto the advisory, if your are also an Alberta tourism or recreation business. Asking Premier Stelmach premier@gov.ab.ca to stop the pending block-cut (commonly called clear-cut) logging in the Castle Special Place / Special Management Area. Asking Premier Stelmach to generally provide more certainty of protection for the natural landscapes that the tourism and recreation industry depend upon. Click here for a copy of the Tourism and Outdoor Recreation Industry Advisory. Logging Scheduled to Start June 10. Time to Write Again! The latest information we have is that logging operations are to start on June 10! Meetings have been held with opposition MLAs discussing how logging will affect tourism in the region Their assistance was sought to stop logging in the Castle. Here is a copy of the briefing note title Tourism and Recreation Industry Advisory, 2011 that was given to each MLA. Letters are needed before March 15th to be of help to those Opposition MLAs wanting to question and hold the government to account for the SRD logging decision. Please address letter to the Premier, with a copy to MLA Evan Berger and the oppostion MLAs. Good to also follow-up with a phone call to one’s MLA after letter sent. In the letters, be sure to ask the addressee to raise your concerns in the Legislature and to reply to your letter. That will allow any of the MLAs below that wish to, to read your letter out to the rest of the Legislature, which resumes work Feb. 22nd. Here is the PowerPoint presentation (12.7 Mb) we made to the open meeting hosted by the Southwest Alberta Sustainable Communities Initiative (SASCI) on Dec 7, 2010. You are currently browsing the Stop Castle Logging blog archives for February, 2011.